Minister for Transport Shane Ross has proposed a ban on rickshaws to allay any risk they cause to public safety. The minister was before the Oireachtas Transport Committee to discuss the issue of regulation of rickshaws, which are a popular form of transport in Dublin and a number of cities around the country. Safety concerns have been raised around the vehicles, leading to calls for them to be regulated. Minister Ross confirmed to the committee that he will consult the Attorney General about the possibility of imposing an outright ban on rickshaws. He said he had "deep concerns about public safety with rickshaws on our streets". Minister Ross cited examples such as "blocking footpaths and forcing pedestrians onto the road. Weaving recklessly in and out of traffic. Little or no heed for the rules of the road. "Breaking red lights. Driving the wrong way up a one-way street. Transporting passengers with little care for their safety." The minister said there had been collisions involving rickshaws and a recent National Transport Authority (NTA) survey revealed "57% of rickshaw passengers as reporting accidents or near misses. This is a shocking statistic". The minister accepted that many in the rickshaw industry have no involvement in criminality. However, he said: "It is a fact that over the past 18 months 154 rickshaw drivers have been arrested in relation to Section 15 Misuse of Drugs Act - possession of a controlled drug for sale or supply - while operating as a rickshaw driver in the Pearse Street district alone. This is not acceptable." The NTA undertook a public consultation on regulation of rickshaws last autumn. "The NTA consultation process reaffirmed many of the concerns that had been raised with me - issues like dangerous behaviour on public roads, lack of lighting, no insurance, illegal use of rickshaws in pedestrian zones, obstruction to buses, as well as blocking taxis from taxi ranks," the minister said. Concern about the lack of a transparent fare structure were also highlighted in the public consultation, which found that 44% of passengers in the survey reported issues with rickshaw charges. The minister said: "It is clear to me that the choice is between a full and effective licensing regime and complete prohibition. Retaining the status quo is not an option." Minister Ross said: "New legislation would be needed but enforcement of a ban should cost significantly less than implementing a full new regulatory regime. "We would still have to define the rickshaw vehicle in law, and provide for detention powers. But this would involve a much simpler piece of legislation. "Enforcement should also be less resource-intensive. The NTA would not need extra staff. Gardaí could be empowered to act decisively when coming upon a rickshaw on a public road." He did acknowledge that "some members of the public would be inconvenienced. And it is true that with a ban our cities could miss out on the sense of adventure and fun that rickshaws can bring". 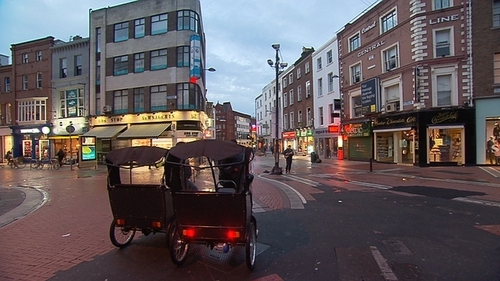 It is estimated that there are around 1,000 rickshaws in operation in Dublin. Minister Ross said he will consult the Attorney General about the possibility of imposing an outright ban on rickshaws. An RTÉ Prime Time programme earlier this year highlighted the issue of drug dealing by some rickshaw drivers. Committee Chairperson Fergus O'Dowd asked if people who have invested money in rickshaw businesses would have grounds to make compensations claims if a ban was introduced. Minister Ross said that was one of the issues that the Attorney General was looking at and all options were being considered. Fine Gael TD Noel Rock pointed to reports of "widespread drug dealing out of these vehicles" and asked the minister if he is personally in favour of a rickshaw ban. Mr Rock said the idea of regulation for such a small industry was "deeply impractical" and he said that he had never been in another European city where rickshaws were operated in such a haphazard manner. The minister said this was principally a matter of public safety and that his instinct was that the best option was that they should not be operating. Fianna Fáil TD Robert Troy said: "I am not convinced that an outright ban is the right way to go and there may be merit in regulation." He said rickshaws are an eco-friendly form of public transport and present huge opportunities. He accused the minister of being lazy by opting for a ban. Sinn Féin TD Imelda Munster adopted a similar tone and asked how other countries appear to have regulated for rickshaws. She questioned why they cannot be regulated in Ireland. "Is it just pure laziness?" she asked. Responding to questions from Solidarity/PBP TD Mick Barry, Minister Ross told the committee that he recently took a few late night journeys on Dublin rickshaws. He said: "I was pretty shocked because it confirmed everything that I had heard about. "They charged me €10 from George's Street to Stephen's Green. The driver certainly broke traffic lights willy nilly. It wasn't very comfortable." He said he got another one and when he asked what the fair would be the rickshaw driver said: "It's whatever you like." "Which was extraordinary," said Mr Ross. "And this person broke every rule in the book."